Reflecting changes in the current health and safety landscape, Occupational Health and Safety Management: A Practical Approach, Third Edition includes examples and tools to facilitate development and implementation of a safety and health management approach. This how-to book is not just an information providing text. It shows you how to write a program and identify hazards as well as involve workers and attain their cooperation. It emphasizes the need for better and more effective communication regarding safety and health. A complete and practical guide for the development and management of occupational safety and health programs in any industry setting, the book supplies a management blueprint that can be used for occupational safety and health in any organization, from the smallest to the largest, beginning to develop or wanting to improve its safety and health approach. It includes comprehensive guidelines for development of occupational health and safety programs to a variety of industries and is especially useful for start-up companies. The author takes a total management approach to the development of written programs, the identification of hazards, the mitigation of hazards by the use of common safety and health tools, the development of a safe workforce through communications, motivational techniques, involvement, and training. He addresses the tracking and acceptable risk from both safety and health hazards. He also discusses how to work with and within the OSHA compliance approach as well as how to deal with the OSHA regulations, workers’ compensation, terrorism, and Lean safety. As you understand and apply the guidelines in each chapter, you can put your company on the way toward building a successful and effective safety and health effort for its employers and employees. For 35 years, Dr. Charles D. Reese has been involved with occupational safety and health as an educator, manager, or consultant. In his early beginnings in occupational safety and health, he held the position of industrial hygienist at the National Mine Health and Safety Academy. He later assumed the responsibility of manager for the nation’s occupational trauma research initiative at the National Institute for Occupational Safety and Health’s (NIOSH) Division of Safety Research. Dr. Reese has had an integral part in trying to ensure that workplace safety and health is provided for all those within the workplace. As the managing director for the Laborers’ Health and Safety Fund of North America, his responsibilities were aimed at protecting the 650,000 members of the laborers’ union in the United States and Canada. Dr. Reese has developed many occupational safety and health training programs, which run the gamut from radioactive waste remediation to confined space entry. He has written numerous articles, pamphlets, and books on related safety and health issues. Dr. Reese, Professor Emeritus, was a member of the graduate and undergraduate faculty at the University of Connecticut, where he taught courses on OSHA regulations, safety and health management, accident prevention techniques, industrial hygiene, ergonomics, and environmental trends and issues. As professor of environmental/occupational safety and health, he coordinated the bulk of the environmental, safety, and health efforts at the University of Connecticut. He is called upon to consult with the industry on safety and health issues and is often asked for expert consultation in legal cases. 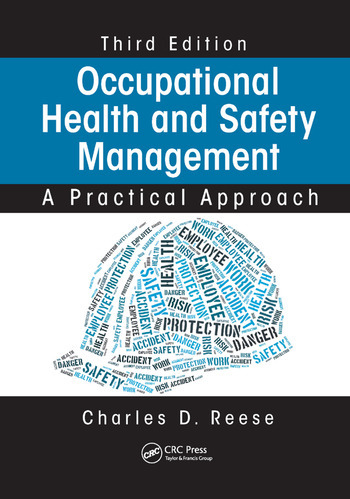 "This 3rd Edition of Charles Reece’s Occupational Health and Safety Management is a must buy for any one seriously interested in all the issues and solutions to occupational safety and health. It is the bible of the field, keeping us all up-to-date with the challenges of maintaining health, wellbeing and safety in the workplace." "… the perfect text for introducing students to the principles and practice of safety management. … straight forward and easy to read. … All of the critical issues involved in implementing occupational safety and health programs are outlined in a systematic approach designed to help safety professionals effectively manage people, technology, and the work environment to reduce injuries and protect employees." "Dr. Reese has done it again! … All of the topics included in this text are required reading. … I heartily endorse the Reese textbook for efficiently and effectively introducing new safety majors to their realm. "Dr Reese has provided a good summary of the many different topics that a student of health and safety must be familiar. The text makes each topic understandable and emphasizes the important elements. But the text is also written for a practicing health and safety manager who can use the questions provided in each chapter to quickly evaluate their own program. … A student or a practicing professional, should have this text at the top of the stack." "… accurate and well researched. The material is a very good update to the previous two editions from Mr. Reese particularly the new section on terrorism. It is timely and more important, "New".